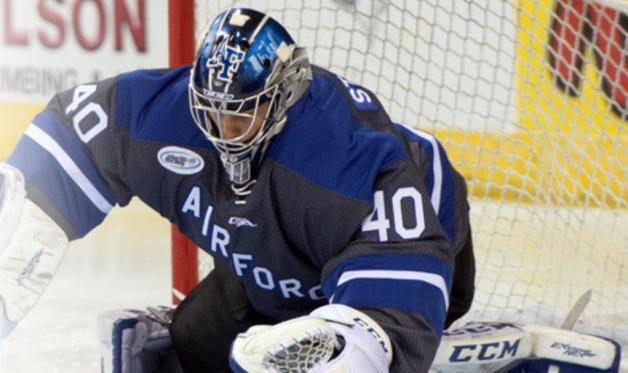 Air Force freshman goaltender Shane Starrett has been named the Atlantic Hockey Rookie of the Month for November. In eight games, the Bellingham, Mass., native helped lead the Falcons to a 4-3-1 record. Starrett posted a .918 save percentage and a 2.16 goals-against average. He was named the AHC Goalie of the Week after stopping 44 of 47 in the Sacred Heart series as Air Force took three points on the road Nov. 20-21. He made 20 or more saves in every game in November and earned his first career win over Mercyhurst with 28 saves on Nov. 6. During Air Force’s 4-3 win over Colorado College on Nov. 27, Starrett made 28 saves to tie as the second most of his career.